The generally-accepted explanation of the state's name is that it is derived from the Sarawak Malay word serawak, which means antimony. A popular alternative explanation is that it is a contraction of the four Malay words purportedly uttered by Pangeran Muda Hashim (uncle to the Sultan of Brunei), "Saya serah pada awak" (I surrender it to you), when he gave Sarawak to James Brooke, an English explorer in 1841. However, the latter explanation is incorrect: the territory had been named Sarawak before the arrival of James Brooke, and the word awak was not in the vocabulary of Sarawak Malay before the formation of Malaysia. Electricity in Sarawak, supplied by the state-owned Sarawak Energy Berhad (SEB), is primarily sourced from traditional coal fired power plants and thermal power stations using LNG, but diesel based sources and hydroelectricity are also utilised. There are 3 hydroelectric dams as of 2015 at Batang Ai, Bakun, and Murum, with several others under consideration. In early 2016, SEB signed Malaysia's first energy export deal to supply electricity to neighbouring West Kalimantan in Indonesia. A number of different bodies manage the supply of water depending on their region of responsibility, including the Kuching Water Board (KWB), Sibu Water Board (SWB), and LAKU Management Sdn Bhd, which handle water supply in Miri, Bintulu, and Limbang respectively, and the Rural Water Supply Department managing the water supply for the remaining areas. As of 2014, 82% of the rural areas have a fresh water supply. The 2015 census of Malaysia reported a population of 2,636,000 in Sarawak, making it the fourth most populous state. However, this population is distributed over a large area resulting in Sarawak having the lowest population density in the country with only 20 people per km2. Although it has a low population density, the average population growth rate of 1.8%, from 2000 to 2010, is very close to the national average of 2.0%. In 2014, 58% of the population resided in urban areas with the remainder in rural areas, but over the next 10 years it is predicted that the urban population would rise to 65%. As of 2011, the crude birth rate in Sarawak was 16.3 per 1000 individuals, the crude death rate was 4.3 per 1000 population, and the infant mortality rate was 6.5 per 1000 live births. ^ "Niah Cave". humanorigins.si.edu. Smithsonian National Museum of Natural History. 30 January 2010. Archived from the original on 22 November 2013. Retrieved 23 March 2015. ^ a b c "Sarawak – Facts and Figures 2011" (PDF). Sarawak State Planning Unit, Chief Minister Department. pp. 5, 9, 15, 22. Retrieved 24 November 2015. ^ a b c d e f g h i j k Frans Welman (9 March 2017). Borneo Trilogy Sarawak: Volume 2. Booksmango. pp. 132, 134, 136–138, 177. ISBN 978-616-245-089-1. Retrieved 28 August 2013. ^ Togunwa, Olayinka; Abdullah, Wan (10 August 2017). "Geochemical characterization of Neogene sediments from onshore West Baram Delta Province, Sarawak: paleoenvironment, source input and thermal maturity". Open Geosciences. 9 (1): 302–313. doi:10.1515/geo-2017-0025. ISSN 2391-5447. The Communist insurgency in Sarawak occurred in Malaysia from 1962 to 1990, and involved the North Kalimantan Communist Party and the Malaysian Government. It was one of the two Communist insurgencies to challenge the former British colony of Malaysia during the Cold War. As with the earlier Malayan Emergency (1948–1960), the Sarawak Communist insurgents were predominantly ethnic Chinese, who opposed to British rule over Sarawak and later opposed the merger of the state into the newly created Federation of Malaysia. The insurgency was triggered by the 1962 Brunei Revolt, which had been instigated by the left-wing Brunei People's Party in opposition to the proposed formation of Malaysia.The Sarawak Communist insurgents were also supported by Indonesia until 1965 when the pro-Western President Suharto assumed power and ended the confrontation with Malaysia. During that period, the NKCP's two main military formations were created: the Sarawak People's Guerilla Force (SPGF) or Pasukan Gerilya Rakyat Sarawak (PGRS), and the North Kalimantan People's Army (NKPA) or the Pasukan Rakyat Kalimantan Utara (PARAKU). Following the end of the Confrontation, Indonesian military forces would co-operate with the Malaysians in counter-insurgency operations against their former allies.The North Kalimantan Communist Party was formally established in March 1970 through the merger of several Communist and left-wing groups in Sarawak including the Sarawak Liberation League (SLL), the Sarawak Advanced Youths' Association (SAYA), and the NKPA. In response to the insurgency, the Malaysian federal government created several "controlled areas" along the Kuching-Serian road in Sarawak's First and Third Divisions in 1965. In addition, the Sarawak Chief Minister Abdul Rahman Ya'kub also managed to convince many of the NKCP insurgents to enter into peace negotiations and lay down their arms between 1973 and 1974. Following the successful peace talks between the Malaysian government and the Malayan Communist Party in 1989, the remaining NKCP insurgents signed a peace agreement on 17 October 1990 which formally ended the insurgency. The Crown Colony of Sarawak was a British Crown colony on the island of Borneo, established in 1946, shortly after the dissolution of the British Military Administration. It was succeeded as the state of Sarawak through the formation of the Federation of Malaysia on 16 September 1963. 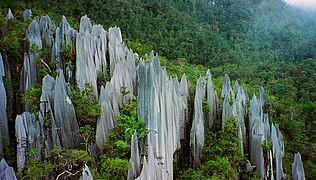 East Malaysia (Malaysia Timur), also known as Sabah, Sarawak and Labuan (Sabah, Sarawak dan Labuan) or Malaysian Borneo, is the part of Malaysia on the island of Borneo, the world's third largest island. It consists of the Malaysian states of Sabah, closer to the Philippines than the west of the country, Sarawak in the west and the Federal Territory of Labuan. 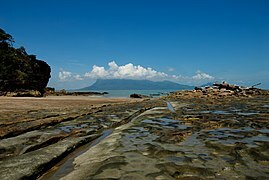 Labuan is an island in its small archipelago of the same name due north of Brunei; its closest land mass is with Sabah. It lies to the east of Peninsular Malaysia (West Malaysia), the part of the country on the Malay Peninsula. 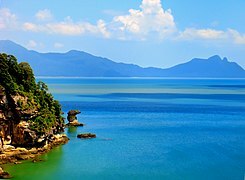 The two are separated by the South China Sea.East Malaysia is less populated and overall less developed in its settlements than its West which contains Kuala Lumpur and Penang however its land mass is larger and it has more of many natural resources including oil and gas reserves. City status award is restrained in the pan-regional style so reserved to Kuching, Kota Kinabalu, and Miri; Victoria, Labuan for example is an Offshore Financial Centre and major port. 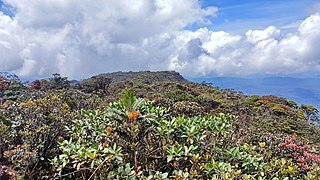 In ecology it has a significant proportion of the biodiverse Borneo lowland rain forests and Borneo montane rain forests. Sir James Brooke, Rajah of Sarawak, KCB (29 April 1803 – 11 June 1868), was a British soldier and adventurer who founded the Kingdom of Sarawak in Borneo. He ruled as the first White Rajah of Sarawak from 1841 until his death in 1868. Brooke was born and raised under the Company Raj of the British East India Company in India. After a few years of education in England, he served in the Bengal Army, was wounded, and resigned his commission. He then bought a ship and sailed out to the Malay Archipelago where, by helping to crush a rebellion, he became governor of Sarawak. He then vigorously suppressed piracy in the region and, in the ensuing turmoil, restored the Sultan of Brunei to his throne, for which the Sultan made Brooke the Rajah of Sarawak. He ruled until his death. Brooke was not without detractors and was criticised in the British Parliament and officially investigated in Singapore for his anti-piracy measures. He was, however, honoured and feted in London for his activities in Southeast Asia. The naturalist Alfred Russel Wallace was one of many visitors whose published work spoke of his hospitality and achievements. The Kingdom of Sarawak (also known as the State of Sarawak) was a British protectorate located in the northwestern part of the island of Borneo. It was established as an independent kingdom from a series of land concessions acquired by an Englishman, James Brooke, from the Sultanate of Brunei. The kingdom received recognition as an independent state from the United States in 1850, and from the United Kingdom in 1864. Following recognition, Brooke expanded the kingdom territory at the expense of Brunei. Several major rebellions occurred against his rule, causing him to be plagued by debt incurred in countering the rebellions, and the sluggish economic situation at the time. His nephew, Charles Brooke, succeeded James and normalised the situation by improving the economy, reducing government debts and establishing public infrastructure. The kingdom was made a British protectorate in 1888. To gear up economic growth, the second Rajah encouraged the migration of Chinese workers from China and Singapore to work in the agricultural fields. With proper economic planning and stability, Sarawak prospered and emerged as one of the world's major producers of black pepper, in addition to oil and the introduction of rubber plantations. He was succeeded by his son Charles Vyner Brooke but World War II and the arrival of Japanese forces ultimately brought an end to the Raj and the Protectorate administration, with the territory placed under a military administration on the Japanese capitulation in 1945, and ceded to Britain as a Crown Colony in 1946. The area now forms the Malaysian state of Sarawak. 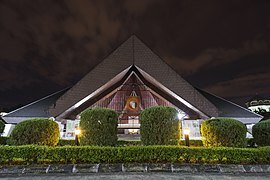 Kuching , officially the City of Kuching, is the capital and the most populous city in the state of Sarawak in Malaysia. It is also the capital of Kuching Division. The city is situated on the Sarawak River at the southwest tip of the state of Sarawak on the island of Borneo and covers an area of 431 square kilometres (166 sq mi) with a population about 165,642 in the Kuching North administrative region and 159,490 in the Kuching South administrative region—a total of 325,132 people.Kuching was the third capital of Sarawak in 1827 during the administration of the Bruneian Empire. In 1841, Kuching became the capital of the Kingdom of Sarawak after the territory in the area was ceded to James Brooke for helping the Bruneian empire in crushing a rebellion particularly by the interior Borneo dweller Land Dayak people who later became his loyal followers after most of them being pardoned by him and joining his side. The town continued to receive attention and development during the rule of Charles Brooke such as the construction of a sanitation system, hospital, prison, fort, and a bazaar. In 1941, the Brooke administration had a Centenary Celebration in Kuching. During World War II, Kuching was occupied by Japanese forces from 1942 to 1945. The Japanese government set up a Batu Lintang camp near Kuching to hold prisoners of war and civilian internees. After the war, the town survived intact. However, the last Rajah of Sarawak, Sir Charles Vyner Brooke decided to cede Sarawak as part of British Crown Colony in 1946. Kuching remained as capital during the Crown Colony period. After the formation of Malaysia in 1963, Kuching retained its status as state capital and was granted city status in 1988. Since then, the Kuching city is divided into two administrative regions managed by two separate local authorities. The administrative centre of Sarawak state government is located at Wisma Bapa Malaysia, Kuching. Kuching is a major food destination for tourists and the main gateway for travellers visiting Sarawak and Borneo. Kuching Wetlands National Park is located about 30 kilometres (19 mi) from the city and there are many other tourist attractions in and around Kuching such as Bako National Park, Semenggoh Wildlife Centre, Rainforest World Music Festival (RWMF), state assembly building, The Astana, Fort Margherita, Kuching Cat Museum, and Sarawak State Museum. The city has become one of the major industrial and commercial centres in East Malaysia. The indigenous languages of Malaysia belong to the Mon-Khmer and Malayo-Polynesian families. The national, or official, language is Malay which is the mother tongue of the majority Malay ethnic group. The main ethnic groups within Malaysia comprise the Malays, Chinese and Indians, with many other ethnic groups represented in smaller numbers, each with its own languages. The largest native languages spoken in East Malaysia are the Iban, Dusunic, and the Kadazan languages. English is widely understood and spoken in service industries and is a compulsory subject in primary and secondary school. It is also the main language spoken in most private colleges and universities. English may take precedence over Malay in certain official contexts as provided for by the National Language Act, especially in the states of Sabah and Sarawak, where it may be the official working language. Malaysia contains speakers of 137 living languages, 41 of which are found in Peninsular Malaysia. The government provides schooling at the primary level in each of the three major languages, Malay, Mandarin and Tamil. Within Malay and Tamil there are a number of dialectal differences. There are a number of Chinese languages native to the ethnic Chinese who originated from southern China, which include Yue, Min and Hakka Chinese. The Chief Minister of Sarawak is the head of government in the Malaysian state of Sarawak. According to convention, the Chief Minister is the leader of the majority party or largest coalition party of the Sarawak State Legislative Assembly. The 6th and current Chief Minister of Sarawak is Abang Abdul Rahman Zohari Abang Openg, who took office on 13 January 2017. 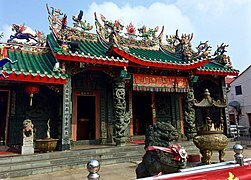 The Matu District is a district in Mukah Division, Sarawak, Malaysia. Before Mukah Division was established, Matu was within Sibu Division. There are more than 20 villages in the district, with Melanau making up the majority of the population. Chinese are the second biggest population after the Melanau. The population is estimated to be around 13,500 in 2006. The Majlis Daerah Matu-Daro (Matu-Daro District Council) is located in Matu town. The building itself is a landmark and the biggest building in Matu. Miri (Jawi: ميري; Chinese: 美里; pinyin: Méi Lǐ) is a coastal city in northeastern Sarawak, Malaysia, located near the border of Brunei, on the island of Borneo. The city covers an area of 997.43 square kilometres (385.11 sq mi), located 798 kilometres (496 mi) northeast of Kuching and 329 kilometres (204 mi) southwest of Kota Kinabalu. Miri is the second largest city in Sarawak, with a population of 358,020 as of 2016. The city is also the capital of Miri District of the Miri Division. Before Miri was founded, Marudi was the administrative centre of the northern region of Sarawak. Miri was founded in 1910 when the first oil well was drilled by Royal Dutch Shell. The discovery of an oil field in Miri has led to rapid development of Miri town. Miri became the administrative centre of the northern region of Sarawak by 1929. During World War II, the Miri oil fields were destroyed by the Brooke government to sabotage Japanese operations in Southeast Asia but to no avail; Miri town was the first landing point of Japanese troops in Borneo. The subsequent Japanese occupation led Miri to become a target of Allied air raids which caused the destruction of oil refinery facilities in Miri. The petroleum industry continued to be a major player in the city's economy after the war. Oil exploration has moved offshore since the 1950s, but subsequently new inland oil fields were found in 1989 and 2011. In 1974, the formation of Malaysian oil and gas company Petronas led to co-operation between Petronas and Shell on oil exploration in the Miri region. 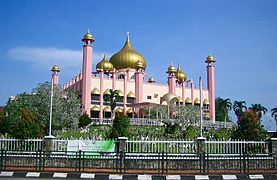 In 2005, Miri became the 10th city in Malaysia to be granted official city status, the first non-state capital city to be bestowed such status. Miri is the main tourist gateway to the world-famous UNESCO World Heritage Site, Gunung Mulu National Park; Loagan Bunut National Park; Lambir Hills National Park; Niah National Park and Miri-Sibuti Coral Reef National Park. The Gunung Mulu National Park with its Sarawak Chamber, which is the largest known cave chamber in the world by area, remains one of the favourite ecotourism destinations in Miri. Miri is also the birthplace of the Malaysian petroleum industry. Other major industries in the city include timber, oil palm and tourism. Pusa is a town, in Betong Division, Sarawak, Malaysia. It is situated nearby Saratok town. Mostly form for native Malay for fish village and famous of fish of "ikan terubok" (Toli shad) and also famous for "gula apong" (palm sugar). Football Association of Sarawak (Malay: Persatuan Bolasepak Sarawak) is a football club that supervises football in the state of Sarawak. The association's football team competes in Malaysia's football league representing the state of Sarawak in Borneo. It is one of the 14 state teams of the Malaysian football structure. They currently compete in Malaysia's second division professional football league, the Malaysia Premier League. The team's home matches are played at the 26,000 capacity Sarawak State Stadium in Kuching, the capital city of Sarawak. The team has won the Malaysia FA Cup (1992), Premier League in 1997 and the Malaysia Charity Shield (1998). In 1999, the team advanced to the quarter-finals of the Asian Cup Winners' Cup after beating Ho Chi Minh Customs of V-League by 5–2 on aggregate in the first round and Yangon City Development of Myanmar Premier League by 4–0 on aggregate in the second round, only to crashing out later to Kashima Antlers of J-League by 2–14 on aggregate. In 2013, the team won the Malaysia Premier League which is their first domestic trophy in 12 years. The Sarawak State Legislative Assembly (Malay: Dewan Undangan Negeri Sarawak) is the state legislature of the Malaysian state of Sarawak. It is a unicameral institution consisting of 82 members elected from single-member constituencies throughout the state. Elections are held no more than five years apart. The State Legislative Assembly convenes at the Sarawak State Legislative Assembly Building in the state capital, Kuching. At 82 seats, it is the largest state legislature in Malaysia. The Sarawak layer cake is a layered cake, traditionally served in Sarawak, Malaysia on special occasions. In the Malay language, the cakes are known as kek lapis Sarawak, Kek lapis moden Sarawak, 'or simply Kek lapis. They are often baked for religious or cultural celebrations such as Eid ul-Fitr, Christmas, Deepavali, birthdays and weddings. People in Malaysia practice an open house on festival day. A unique feature of Sarawak's open houses is the modern layered cakes. Song is a town, and the capital of the Song District (3,935.2 square kilometers) in Kapit Division, Sarawak, Malaysia. The district population was 20,046 according to the 2010 census. Song is situated by the banks of the Katibas River, a tributary of the Rajang River. It is an important stopover for river traffic going up the Rajang River. The states and federal territories of Malaysia are the principal administrative divisions of Malaysia. Malaysia is a federation comprising 13 states (Negeri) and three federal territories (Wilayah Persekutuan).